It has been a great year for Paul Rabil. After being traded from the Boston Cannons to the New York Lizards in early January, Rabil excelled during the regular season. He scored 24 goals and contributed another 15 assists during the season, and then went on to dominate during the playoffs as well. Rabil and the Lizards would wind up winning the Steinfeld Cup as MLL Champions, and Rabil claimed the Coca-Cola Player of the Game MVP award for the championship. Through all that success, however, Rabil still found some time away from training to hang out with the guys from Dude Perfect. They filmed and released another epic video, this time centered around Paul Rabil and some incredible lacrosse trick shots. The Dude Perfect guys also had time to interview Rabil. One of the most interesting things was about his diet. He maintains his peak physical shape by starting his day with a whey protein shake. He’ll also eat 8-10 eggs, mushrooms, spinach and kale for breakfast. For lunch, he’ll eat chicken breast. Rabil adds in two fish per week, usually salmon. He adds that he’ll later eat more chicken, brussel sprouts, asparagus, broccoli, some fruit or berries, and of course lots of water. Rabil’s hard work and fine tuned eating have paid off in big ways for the lacrosse star. Check out the video below for some of Rabil’s amazing lacrosse trick shots, and a whole lot of awesomeness from Dude Perfect. 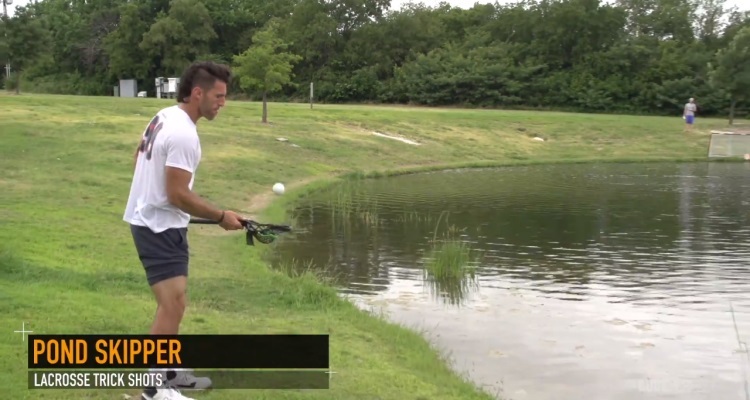 Be the first to comment on "Paul Rabil’s Lacrosse Trick Shots with Dude Perfect"